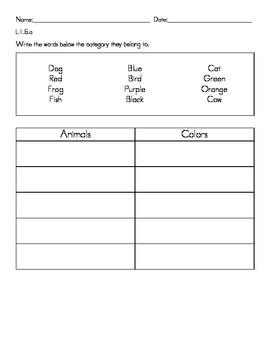 This assessment was developed to help assess the common core standard L1.5.a Sort words into categories (e.g., colors, clothing) to gain a sense of the concepts the categories represent.. I developed and used this with my own 1st grade students. I will be developing more short assessments to help me know if my students are mastering or still need practice with common core standards. I hope you find this as useful as I have.